Benson Carlin was born in Brooklyn, New York on September 1, 1915. He graduated from Brooklyn College with an AB degree, and received his MA from the State University of New York in Albany. After holding a number of positions as both a teacher and radio technician, he developed the program for radio engineering for the Signal Corps at Fort Monmouth, where he taught until July 1943. His interest in radio engineering led to early development work in ultrasonic testing, first at the Radiation Laboratory at MIT and then at Sperry Products, where he developed the first commercial ultrasonic pulse tester. At Sperry, he worked with pioneering Ultrasonics designer, Floyd Firestone. 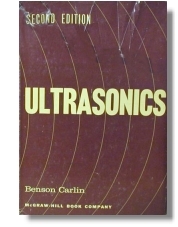 In 1949, Carlin wrote the first book in English on this new technology, 'Ultrasonics' (McGraw-Hill). He also published numerous articles on ultrasonic applications, eventually earning over 50 patents for his work on ultrasonic circuitry. His work on high-frequency sound imaging led to the development of new medical imaging equipment, including the first ultrasonic scanners (used originally for scanning the brain), humidifiers, cleaners, and whistles. He pioneered industrial uses of high-frequency sound, both for material testing and for welding. Through the late '50s and early '60s, Carlin increasingly worked on medical equipment design. He was Vice-president and chief engineer at the Circo Ultrasonic Corporation. In 1969, he became President and co-owner of OEM Medical, Inc., a maker of oxygen-therapy equipment, where he designed the first disposable humidifers and oxygen masks. He retired in 1980. In 1986, Carlin was honored by the Smithsonian's National Museum of American History when the original prototype for his ultrasonic brain scanner was made a part of its permanent collection on medical imaging. In 1988, he participated in a symposium on the history of Ultrasound in Medical Imaging in Washington. Besides his achievements as an inventor and engineer, Carlin had a lifelong interest in drawing and painting. His watercolors were shown in several amateur exhibitions. Carlin passed away on June 22, 1996 at St. Mary's Hospital in Langhorne, PA, of heart failure. He was 80 years old. He is survived by his wife Vivian F. Carlin, a published author on gerontology, three sisters, and two sons, Robert Carlin of Lexington, NC, a musician and folklorist, and Richard Carlin of Glen Ridge, NJ, an author and editor. Adapted from an obituary by his son, Richard Carlin, in 1996.